The colder weather, sugar cookies, apple pie, candy canes, snow, hot cocoa, waxes, sealants, coatings, etc. the list goes on and on with things that remind us all of the holiday season, well at least for detailers anyway. Thanksgiving, Christmas, it really does not matter, the holiday season is here and everyone here at DI could not be more exited! Sure there is a lot of stress that can come with these holidays, and finding that perfect gift can add to it. Everyone has specific things they want or need and some just do not know what to ask for on their Christmas list. If you are finding it tough to shop for anyone who loves their car we are here to help! Additionally if you love detailing let your family and friends know what items you would like! Below you will find gift recommendations from our team at Detailed Image and from several of our Ask-A-Pro Authors. 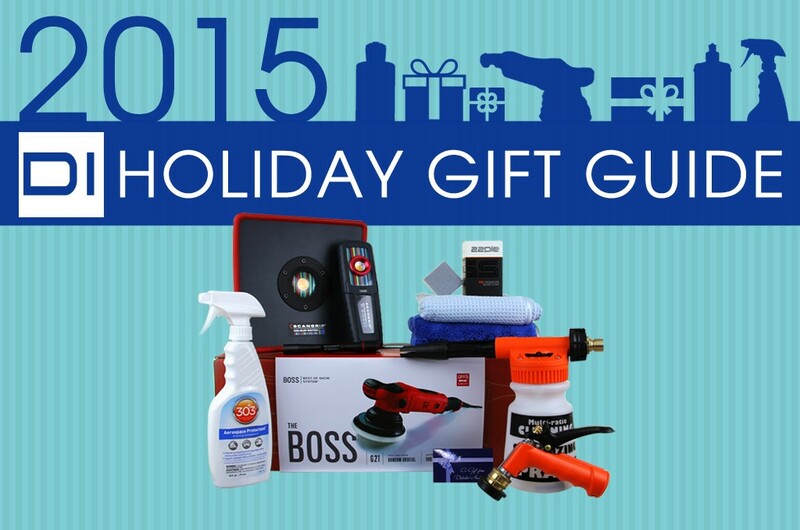 Whether it is something as small as a microfiber towel, or as large as a brand new buffer, the list below will help guide you in finding that perfect gift for any car enthusiast. Of course if you’re not sure what to get do not hesitate to contact us. We will be more than happy to help you find the best product for loved one! Griot’s Garage THE BOSS – G21 – If you are looking for that over the top, “WOW”, gift idea, THE BOSS G21 is exactly what you are looking for. This amazing polisher comes with a 21mm throw, and it is packed with 900 watts and 7.5 amps of pure detailing muscle. Imperfections are really no match for this unit and three words are key when describing THE BOSS, performance, control and comfort. I could go on and on why we all here at DI love this polisher, but why not take the word of Ask-A-Pro Author Chad Raskovich of Rasky’s Auto Detailing with his product review. 22ple VX3 & Applicator Pad – Coatings have really taken the detailing world by storm and we can all agree that they are here to stay. With the amount of protection and gloss supplied by these coatings, it is hard to want to use anything else. The only drawback was that these coatings were more temperamental to work with than sealants or waxes, until now. The 22ple VX3 is super easy to apply and like I just mentioned, the gloss is amazing. It applies very similar to traditional waxes so it’s a quick and easy process. If someone you know loves their car and has never tired them before, this is the one that will change their mind. Pair it with the 22ple Applicator and you have yourself a gift that will keep any detailer smiling. Scangrip Lights – Scangrip lights have really taken us here at Detailed Image by surprise. As detailers we were always frustrated with using lights that would not work great at showing imperfections in the paint, or ones that frankly would not last long at all. Scangrip not only answered these concerns, but they absolutely blew us away. They may be more on the expensive side, but they have a light for anyone. The I-Vew is a great hands free headlamp, the Matchpen is small and easy to maneuver, the Sunmatch just won an award at SEMA 2015 for best refinish product and the Multimatch is a great all around work light for any situation a detailer comes across. For more information on these great lights, check out our Scangrip Brochure. 303 Aerospace Protectant – This versatile product protects just about the whole interior (vinyl, plastic, rubber, leather) and it will block out UV rays to help preserve the finish. You can apply it to the dashboard, doors, console, arm rests, exterior trim, rubber moldings, and much more! Aerospace will leave behind a beautiful matte finish that is not greasy, shiny or oily and treated surfaces will resist dust, soiling, staining and will also repel water. It is a great all around product that will really be of use to all detailers. It will also work amazing on any patio furniture, umbrellas and any other outdoor furniture you have around the house, making it a great all around product to have on hand. Gilmour Foamaster II Foam Gun – If your detailer is looking to spice up his wash process, the Foam Gun is a great addition. The Foamaster easily attaches to a standard garden hose and is compatible with any car wash shampoo. Turn the hose on, spray onto the car, and simply put, have more fun while washing! Not sure what shampoo to buy? The Foamaster II Starter Kit includes two awesome shampoos and everything you need to get started with a Foam Gun. For the detailer that has a pressure washer, the DI Accessories Foam Lance is also a fantastic gift! Microfiber Towels – As a detailer, you can never have too many microfiber towels laying around and we have so many for you to choose from. The Waffle Weave Drying Towel which is great for drying your car and it comes in two great sizes. The Ultra Plush Two Sided Towel features two different size naps, and the popular All Purpose Towel that can tackle any job you throw at it. If you are looking to try something new and exciting, the Deep Blue Towel, Great White Towel, Super Silky Soft Towel, and the Microfiber Detailing Apron are all great choices. Not sure what to pick, grab the Microfiber Sampler Kit for a taste of a few different towels. Gift Certificate – Not sure what to buy, a DI Gift Certificate is one of the best ways to make sure your detailer gets exactly what is on their wish list! We offer gift certificates in any denomination and they are e-mailed out to you instantly upon purchase! CarPro Tar X Tar & Adhesive Remover – A great product that quickly and easily breaks down tar deposits and safely removes them. Doesn’t stain the paint at all and safe to use on most surfaces. Optimum Opti-Seal – Easy to use product that works well and goes a long way. One bottle should easily last a year or two depending on how many cars it is used on. Metro Vacuums Blaster SideKick Blower or Master Blaster Revolution (depending on budget) – The sidekick is a great tool for drying hard to reach areas as well as aiding in drying the car overall. Master Blaster Revolution is the sidekick on steroids and LOTS of steroids. A lot more powerful and makes quick work of drying anything. Sonax Wheel Cleaner Plus (5L) – Years supply of clean wheels? That’s the kind of gift that will have him proposing or renewing vows. Car Pro Iron-X (1L) – A must have for white vehicles. This will ensure the vehicle looks as bright as day one. Every time your car enthusiast sees his/her ultra white car, you’ll be associated with that happiness. reTHICKulous Microfiber Towels – A true pampering towel for that final wipe down or quick detail. Show your car enthusiast you care with the nicest towel on the market. Wheel Woolies – Being able to clean all the way to the back of the wheel barrels will change how you feel about cleaning wheels. CarPro HydrO2 – Extremely easy application of a very good sealant that you can use all around. reTHICKulous Wool Wash Mitt – Take your car wash pampering to the next level with this super soft mitt that holds suds like a dream. CarPro HydrO2 – I believe I used this last year, too… but it is just that good. The absolute easiest and fastest way to protect nearly every part of the exterior of your vehicle. Double Thick Edgeless Towels – A great, plush microfiber that is excellent for quick detailers, rinseless washing, or anything that requires a gentle touch. Griot’s Garage Fast Correcting Creme – If you’ve got some paint correction to do, this compound is a good choice to have on hand. We’ve really enjoyed using this stuff! If you have any questions about any of these products, or if you would like more holiday gift ideas please do not hesitate to contact us. Take care everyone and Happy Holidays! You have the best quality selection of parts in your kits.